Data in this report are drawn from the panel wave conducted November 7-13, 2018.1 A total of 9,451 panelists responded out of 13,570 who were sampled, for a response rate of 70%. The cumulative response rate accounting for nonresponse to the recruitment surveys and attrition is 3.3%. The margin of sampling error for the full sample of 9,451 respondents is plus or minus 1.7 percentage points. The ATP data were weighted in a multistep process that begins with a base weight incorporating the respondents’ original survey selection probability and the fact that in 2014 and 2017 some respondents were subsampled for invitation to the panel. 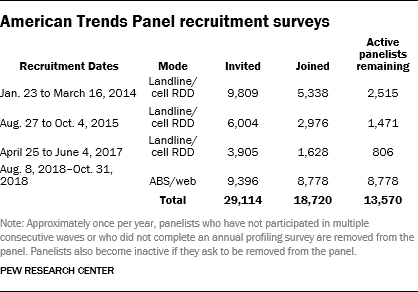 For panelists recruited prior to 2018, an adjustment was made for the fact that the propensity to join the panel and remain an active panelist varied across different groups in the sample. No adjustment was made for new panelists from the 2018 recruitment. 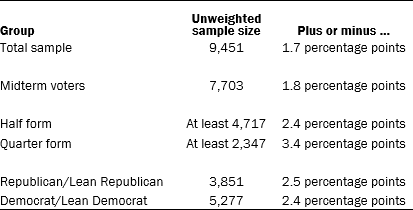 The final step in the weighting uses an iterative technique that aligns the sample to population benchmarks on the dimensions listed in the accompanying table.